Have You Got A "Clue"? 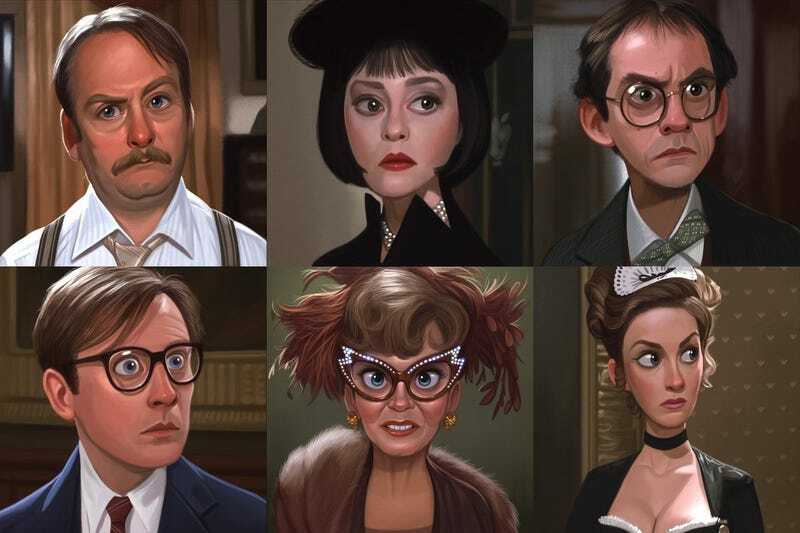 I was on Twitter and this image of the cast of the movie Clue, painted as caricatures by Jeff Delgado, came up. Reduced to stylised prominent facial features, it made me look at the actors in a new way, and made me wonder who I would cast in a remake, if I wanted contemporary actors who looked very similar and had some comedy chops too. Priyanka Chopra as Miss Scarlet, a big star in India and recently in the movie Baywatch. John Hodgman as Colonel Mustard, someone who doesn’t act really, but is a very funny man with a nerdy personality. Rachael Harris as Mrs White, who reminds me more of Julia Duffy really, but both could be a great Madeline Kahn substitute. Rachael is my favourite character in Lucifer currently. Jack McBrayer as Reverend Green. He needs no introduction. Rami Malek as Wadsworth. He’s done a bit of comedy and maybe isn’t the perfect Tim Curry-a-like, but then who is? Jake Johnson, who I think is so similar to Christopher Lloyd they should cast him as young Doc Brown in a BTTF prequel. And finally Missi Pyle as Mrs Peacock, a rather perfect Eileen Brennan replacement I think. I have a great love for Clue, and for its spiritual parent Murder By Death, which also starred Eileen Brennan, as the comedy murder mystery is rarely done at all these days (unless you count things like Psych’s tribute episode, or Angie Tribeca). I even have an idea to write my own one day, if I ever get my arse into gear. My one big problem with Clue is something a lot of people actually love, and that is the multiple endings. I think the key to a good murder mystery has to be that the mystery can be solved by the viewer once the clues are put together and the red herrings eliminated, and unfortunately having a conclusion where potentially anyone, or everyone, be the culprit undermines that. In my screenplay I’d make sure the mystery holds up, and then weave the comedy around it, and not go surreal like it does in Murder By Death. They keep talking about a Clue remake, but as far as I know it still hasn’t gone ahead. I imagine the cast will not be in any way a group of lookalikes, and they will be more diverse and contemporary, with a different storyline. I look forward to see what they come up with. And I also am willing to make it myself if they give me the chance. I’m sure they give big comedy movies to unknowns with no experience.